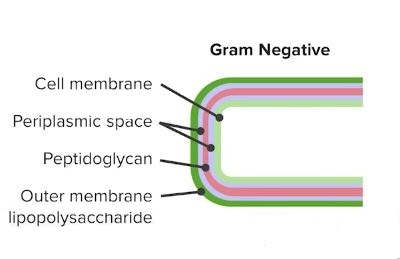 Lipopolysaccharide (LPS) layer also called the outer membrane is the outer most layer present in the cell wall of gram negative bacteria. It is a characteristics feature of Gram negative bacteria. As in peptidoglycan biosynthesis, LPS molecules are assembled at the plasma or inner membrane. Exception: Only one Gram positive bacteria, i.e. Listeria monocyotogenes has been found to contain an authentic lipopolysaccharide. A phospholipid called Lipid A; It embeds Lipolysaccharide layer in the outer leaflet. Also known as endotoxin, it is responsible for toxic effects (fever and shock). Generally it is not released until death of cell. Exception: Neisseria meningitidis, which over-produces outer membrane fragments. 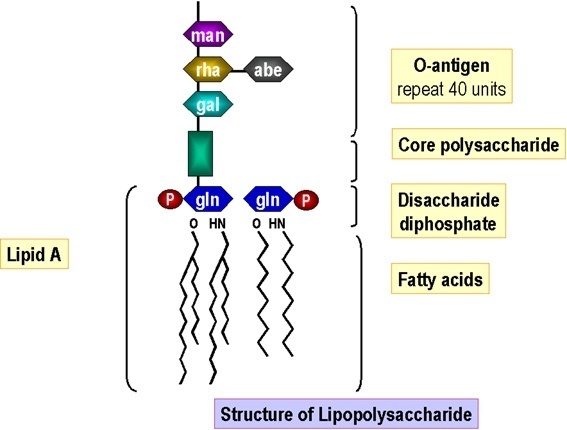 A core polysaccharide of fiver sugars linked through ketodeoxyoctulonate (KDO) to lipid A.
O antigen: An outer polysaccharide consisting of up to 25 repeating units of 3-5 sugars. These are hydrophilic in nature. O antigen is highly varied among species. Example: E.coli O157:H7 which causes food poisoning and hemolytic uremic syndrome. O antigens are used to identify certain organisms in microbiology laboratory. O antigens are toxic and account for some of the virulence of certain gram negative bacteria. Note: LPS is heat stable and not strongly immunogenic so it cannot be converted to a toxoid. LPS activates macrophages, leading to release of TNF-alpha, IL- 1 , and IL-6. IL- 1 is a major mediator of fever. Macrophage activation and products lead to tissue damage. Damage to the endothelium from bradykinin-induced vasodilation leads to shock. Coagulation (DIC) is mediated through the activation of Hageman factor. Only Listeria monocytogenes? What about Mycobacterium spp. , I read it in a book. whats is the mode of action of endotoxins ?